TS Maybe wins the Tall Ships Regatta Race 1. Tall Ship Maybe and her crew raced hard from Liverpool to Dublin securing 1st position in Class B and also 1st position overall in the first Race of the Tall Ships Regatta. On board were a group of young people from Liverpool and Dublin, along with a few young at heart trainees too! Under the watchful eye of Grace the skipper and Seb the 1st mate, the trainees worked tirelessly to trim sails night and day to ensure they were on the best point of sail for the wind conditions. Well, it paid off and a huge congratulations to all involved. And…if that wasn’t enough! 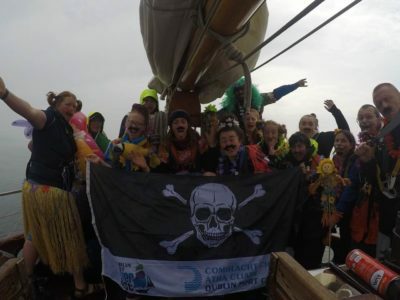 They also scooped the award for most spectacular entrance into Dublin Port as they donned their Caribbean hula outfits, decorated Maybe with inflatable palm trees and flamingos and danced and sang their way into the port. We are all so proud of everyone on board and the huge effort they made to make sure Maybe was a winning ship!